Confession is usually available on Tuesday evenings between 6:00pm – 6:40pm and on Saturday mornings from 9:45am – 10:15am and by appointment at other times. 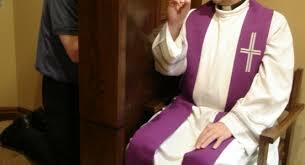 For Catholics the main focus of confession is the mercy and forgiveness of God. No one finds going Confession easy. To tell someone our deepest secrets, our faults, what we have done, and what we have failed to do can be really hard. But we say all these things trusting in the total forgiveness of God for us. The Sacrament of Confession is among the most beautiful things we can do.